I believe it is important to provide a synopsis of both films here, because The Matrix Reloaded assumes the viewer has already seen the fist instalment. Any newcomer to this three-part storyline will be completely lost by beginning here. The premise is complicated enough as it is. Ask four people what the plot of Reloaded is and the chances are you'll get four different answers. I did. This one leaves far more new questions than it does tie-up loose ends from the original film: Why didn't the sentinel machines simply follow the human ships into Zyon? Why don't the survivors in the real world simply awaken all the human batteries plugged into the Matrix? The cocoons were not well protected when Neo awoke from his in the first film. Are the twins programs written for the Matrix? Otherwise where did their unique abilities come from. All aware humans have extra abilities within the Matrix, but how did Neo come by his extraordinary gifts? Perhaps some of these questions will be answered in the last of the trilogy, but I doubt it. 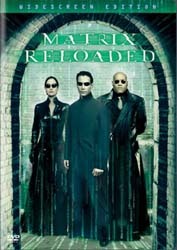 The Matrix was an intelligent science fiction story with original ideas and new ways of realising them for the screen. It's almost as if the Wachowski brothers listened to the praise before dreaming-up a hyper-convoluted continuation which is just too complicated for even the most avid SF fans. So let's leave the plot behind, because this is an extremely entertaining arrangement of set pieces. The fight scenes are better than ever; the multiple Mr Smith example is itself longer than all of those featured in The Matrix. By far the biggest moment in the movie is the meticulously planned and brilliantly choreographed freeway chase, which incorporates several spectacular stunts, amazing effects and gripping martial arts. The extras documentary on this scene takes you from the script to the storyboards, a computer animation realisation, many discussions involving models, and practice runs on a mile and a half stretch of freeway literally built from scratch. And taking of extra features, aside from the aforementioned freeway chase there is a shorter behind-the-scenes documentary, a featurette which looks at how the trilogy of films tie-in with The Animatrix and the computer game, a blatant advertisement for The Animatrix, the making of the game Enter the Matrix, the MTV movie awards, and design and advertising inspired by The Matrix. A fair amount, granted; but do they warrant a second disc? Maybe, maybe not. The Matrix DVD release set the trend for what was to come with a veritable plethora of features and linking themes, all on a single disc (at least initially). Reloaded carries a more standard format, when it could have once again reinvented the DVD format. Or am I expecting too much? In many ways The Matrix is a better film than Reloaded, but the constant action scenes make this one more exciting to watch. So, my advice is to disengage your brain and enjoy the romp.